OR: 13 Things I learned from my disappointing trip to a spa. As some of you may know, I recently moved. I am now settling into my new home, working on getting my Florida massage therapy license transferred and trying to find a few local therapists for my regular massages. I also try to get a deep pore facial about once a year. I booked myself an appointment for a 90 minute Deep Tissue massage and 60 minute facial with extractions at a local place. This spa visit should have lasted two and a half hours, but what I experienced was over fours hours of learning what NOT to do as massage therapist and business owner. And thus, we have the Don't Post. Everything that follows really happened.Warning: This is long and full of my opinions. 1. Don't Talk Down To The Employees: When I was getting checked in, the receptionist was going through the motions of noting me in the computer, giving me my intake form and making sure I knew where to wait. The owner, who was overseeing the receptionist, spoke to her in a condescending tone and gave her directions AFTER the receptionist had already completed the tasks. The way an owner speaks to their staff sets a very specific tone in the eyes of the customer, so don't make it a negative one. 2. Don't Be Afraid To Remind People To Keep Noise To A Minimum: When you come to a spa, whether it be for relaxation or more specific health reasons - most people are coming to give themselves a break. A bit of self care. The environment your client enters should be supportive of that. While waiting in the sitting area, there were two other clients having a very loud conversation (one of the clients was physically acting out how she was dancing on stage at a Tony Robbins convention and cheering for him. Like you do.) Yelling "Tony! Tony! Tony!". The other client was happily watching until her phone rang. (She was using a "Clown Nose" honk. Because that's a thing.) As Ms. Clown took the call, the Tony Cheerleader took that as her cue to call Jennifer. Apparently, Jennifer is hilarious because The Tony Cheerleader was snorting for a solid 5 mins. The seating area was literally next to the front desk check. Neither the owner nor the receptionist said a word to them. 3. Don't Forget To Check The Bathrooms Regularly: I went to the ladies room before my session and the toilet was…"speckled". When I visited the restroom again about 2 hours later, it was still "speckled". Gross. 4. Don't Wear Sloppy Clothes: My therapist came in to greet me and it dawned on me how much I am used to seeing therapists in all black, a uniform or any combination of comfortable, yet professional clothes that say "these are my work clothes". My therapist was wearing a large wrinkled shirt and old sweatpants rolled up to the knees. Until now, I had never really thought about how much looking clean and together mattered to me. Furthermore, during the session his shirt fell on my face and undraped arms many times. At one point I had to alert him to the fact that his shirt was completely covering my face during a neck stretch. 5. Don't Ignore The Intake Form: When my therapist brought me back to the room he asked if I had ever had a massage before. Not only had I answered that on my intake, it also asked when my last session was. Additionally, the form asked me my occupation. 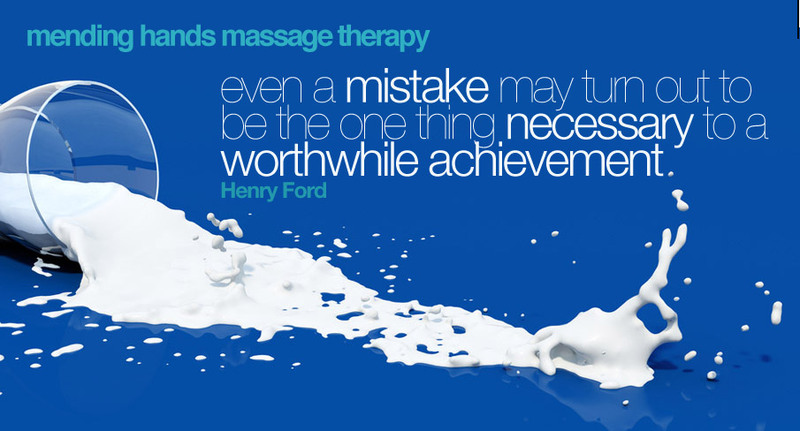 So one could deduce that as a massage therapist I would have had massages before. The intake asked if I had any chronic conditions - I checked TMJ. He never asked me about it. Nor did he work on my face or jaw at all. My therapist asked "So are you just here for relaxation?" When I told him my appointment was for a Deep Tissue full body massage, which I had also written in on my form - his response was "Well, that's an extra $15". I know. I booked the session. I confirmed the session. I noted this request on my intake form. I can understand not taking in all of an intake before meeting with your client, but when it is evident that a practitioner hasn't even looked it over, it made me feel like a number. Just another body that was on his schedule for the day. You can tell a lot about a place by their intake form, they can learn even more about the client. Don't waste it. 6. Don't Talk The Whole Time (or ask personal questions, tell me your life story, tell me it's been too long since you have gotten a massage or get political, etc): The first question my massage therapist asked when he came back in the room was "So, why did you become a massage therapist?". Sigh. What makes this moment even harder is the reason I became a massage therapist comes from a heartfelt but scary part of my life, it's not a story I share lightly and not something I want to dive into when I am about to get a massage. The rest is simple - don't talk to your client the whole time, especially when they are not matching you in conversation. Double - especially if the topics have nothing to do with the session. 7. Don't Ignore Requests: I had to ask him three times to lighten his pressure in certain areas. I requested that he adjust the angle of my arm as not not put my elbow into hyperextension twice as well (I eventually just moved my arm). I asked for extra time on my feet. HE NEVER EVEN MASSAGED THEM! It's such a simple thing. Listen to your client. 8. Don't Forget To Keep Your Client In The Loop: After my massage I was lead into another waiting room. I had been waiting a while and no one came by. I continued to wait, then 10 minutes AFTER my facial was scheduled to begin I walked myself to the front desk to ask what was going on. They didn't know. There was a scramble and I was lead back to the waiting area with an apology. While I waited, I could hear the talkative nail tech with her client (see #2). She and her client were cussing about the recent election and complaining that her child was "really a two year old with the devil's vicious ways inside him". She really said that. (See #6). A full 45 mins later, my esthetician came to get me for my session. Life happens and sometimes schedules get out of sorts. Make sure your client is kept in the loop or they might just feel abandoned and become rightfully disgruntled. 9. Don't Start A Session Until You Are Ready To Start: Even though my facial was delayed 45mins, my esthetician was not ready for me. The room was fully lit, she did not have all her supplies and left the room twice to get them. When she finally sat down to start, she realized that there was no music in the room. This led her to find there was no cd player or iPod dock in the room. She left a third time to track one down. 11. Don't Push Products You Know Nothing About: Before she even turned on the steamer, my esthetician was trying to sell me products she didn't know anything about. I asked her some simple questions about them and she just rambled on about the way they smelled. 12. Don't Do A Bad Job OR Decide Not To Do Your Job At All: I only get extractions about once a year (twice at the most). I think of it as a "spring clean" of sorts for my pores. I have blackheads on my nose and chin. After the facial, I still do. Why? My esthetician told me she didn't want to do extractions. I don't have any risk factors, I have had this treatment many times before, she is fully licensed so I didn't understand why. When I asked, she said "I think the nose and chin are too difficult to clean out." At this point my visit was now just an "experience to learn from", so I didn't argue with her. Yes, I made sure that this treatment was not on my final bill. 13. Don't Be A Spa Owner Who Is On The Phone With A Personal Call Talking About Judy's Birthday Dinner Plans While The Client Waits 7 Minutes To Check Out: Yes. I timed her. If you want to be healthy, you know you've got to eat more greens and hit the gym. But did you know that cuddling your pillow a little longer also does you good? While it's not a new discovery that sleep makes us feel better, in the past several years medical research has shown that slumber has a much bigger impact on our overall health and fitness than just keeping away those under-eye bags. The problem is that, in the midst of our hectic, workaholic lives, getting enough rest tends to be a low priority. In fact, a study published this month in the journal SLEEP confirms that time spent punching the clock has the biggest effect on how much a person sleeps. The more hours a person works, the less sleep he or she gets, says Dr. Mathias Basner, a research associate at the University of Pennsylvania and author of the study. "In a culture that puts a premium on people who work hard, get a lot done and don't take time off, and where we provide the means for them to work and be entertained all of the time, the message goes out that [sleep] isn't important," says Dr. Lawrence Epstein, medical director of Sleep HealthCenters, a network of specialized sleep medicine centers, and author of The Harvard Medical School Guide to a Good Night's Sleep. "That's the wrong message. 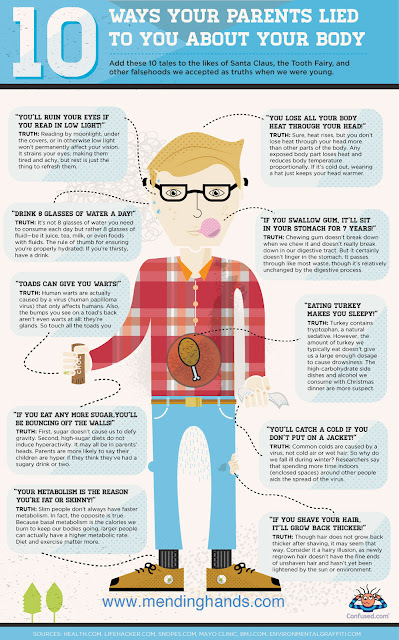 "The irony, experts say, is that the less sleep you get, the worse you're bound to perform at work. Restless RisksBeyond work effects, most people don't realize what insufficient sleep can do to their health. During the various stages of sleep, a lot more is happening than we realize. Our blood pressure drops, blood supply to our relaxed muscles increases, tissue growth and repair occurs and our energy levels are restored, according to the National Sleep Foundation. If you have a sleep disorder or you're just not making sleep a priority, you're at a greater risk for cardiovascular disease and hypertension. Not getting enough rest can impair the body's ability to use insulin, predisposing us to diabetes and obesity, says Dr. Carol Ash, a board-certified sleep and pulmonary specialist and medical director of the New Jersey-based Somerset Medical Center's Sleep for Life Center. The Magic NumberWhile the amount people need varies, experts say adults should get seven to nine hours per night. Regardless of the numbers, if you're dragging yourself out of bed in the morning, fighting off the need to nap in the afternoon or falling asleep watching TV, you're probably not getting enough. To figure out what you need, during your next vacation Epstein suggests going to bed at the same time every night and sleeping in. After a few days you should start waking up at the same time and have an idea of how much sleep your body demands. Carving out that kind of time for sleep in your daily life, though, is another story, and every time we miss a few hours we accumulate sleep debt. Sleeping six hours a night for two weeks will create the same degree of sleep deprivation as staying up for 48 hours, Epstein says. And, despite popular belief, your body doesn't adapt to getting insufficient sleep. Instead, he says, "you just keep getting sleepier and sleepier." Sleep SaboteursEven when you have time to devote to sleep, you could be unknowingly sabotaging its quality by eating or drinking too close to bedtime, or slumbering in imperfect conditions. Devices such as Innovative Sleep Solutions' Sleeptracker Pro, available this fall, could help you pinpoint the problem. Worn as a watch, it records the average time between your restless moments during the night. The longer the stretch is between these moments, the more restful your sleep. Upload the data to your PC and you can input factors such as a late dinner, a strenuous workout or alcohol intake, which might have had an impact. It shouldn't take long before a pattern appears, says Lee Loree, the product's developer and managing partner of Innovative Sleep Solutions. Making your bedroom slumber friendly also can improve the quality of your sleep overnight, says Dr. Rubin Naiman, director of sleep programs at Miraval Resort, Tucson. He suggests sleeping in a darkly painted room, using organic sheets that won't irritate your skin or respiratory system, setting the room at 68 degrees, removing the TV and all LED lights and installing light bulbs that lack blue light rays, which suppress sleep promoting melatonin. No EscapeOf course if you continue putting off a good night's sleep, you may not see the negative health effects right away. But the impact, experts say, will catch up with you eventually. "As we get older, we are less and less resilient, especially past 40," Ash says. "Not adhering to sleep rules will really wreak havoc." In new research, applied cervical and upper thoracic massage and manipulation reduced headache-pain intensity in patients with migraine headaches. "Migraine headache significantly impacts the health of individuals and of society," researchers from the Faculty of Medicine at Tehran University of Medical Sciences, in Tehran, Iran, stated in an abstract published on www.pubmed.gov. "The application of simple physical nonpharmacological techniques could greatly reduce the therapeutic costs and side effects in acute onset of such headaches." For this study, 10 male patients (mean age was 32.0 ± 10.59 years) with acute onset of a migraine headache according to IHS-2004 diagnostic criteria were enrolled in the study. Neck and upper-thoracic-spine massage and spinal manipulation technique were performed. Headache pain intensity was assessed before and after the intervention by means of a verbal analog scale. Following treatment, headache pain intensity was significantly reduced compared to the pretreatment values, according to the abstract. No side effects were observed, and all of the patients reported satisfaction with the intervention. This morning I discovered that the Mending Hands Blog has been read in 50 countries! 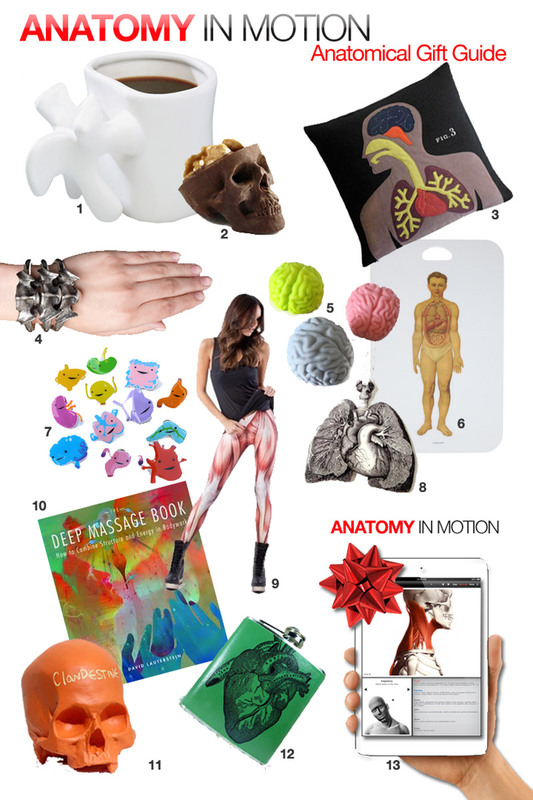 Thank you to all the readers for joining me in the exploration the massage, health and wellness world! I appreciate you reading, sharing and helping Mending Hands grow! A short time ago I announced that my husband had taken a job in Sarasota and that we would be moving to the Sunshine State. 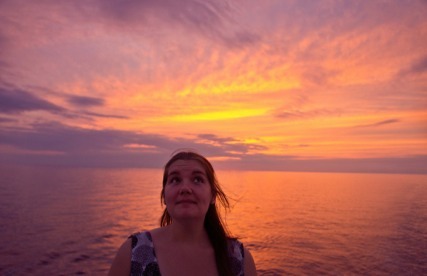 We had just 5 days to decide what we were going to do with this huge life changing job offer. A leap that would only leave about 6 weeks before needing to close Mending Hands in Brooklyn. I have recieved a few requests from readers, colleagues and the amazing Facebook massage community to take a little time to write about my experiences as I make this transition. So I thought I would start with the five things I have already learned about Mending Hands (since I knew I would be relocating). 1. I don't like my job. I love it. Getting myself licensed in Florida is going to take some time. I have to pass their required exam, plus a few new classes (mainly Florida specific laws and such). Add a few weeks of paper work with the office of professions - mailing, stamping and signing documents will take some time. Which means I won't be giving massages for a few months. This is so weird to me. Yes, I will be more than busy with packing, unpacking and exploring our new city. I also promised my husband I would…what's the word? Relax. I promised him I would take some time to relax and enjoy this break (being that I will be near white beaches and clear water, I think I might be able to give into it a little). Yet when I think of the fact that I will not be massaging for a few months. It makes me sad. I love being a massage therapist. I love the work, the creativity, the care and connection. Knowing that this part of my life will be taking a back seat for a few months makes me realize how much I love it. 2. I don't like my clients. I love them. When I sent out my newsletter announcing this move, I had knots in my stomach the entire day. I knew that this was going to be hard for me but I had no true gauge of how my clients would react. It has been about 3 weeks since my clients were told and the amount of love, support and sadness I have heard from them is incredibly humbling. The first time I had a client tear up after a session when they said "I can't believe you are not going to be here, these sessions just aren't going to be in my life anymore." had ME in tears! Then the next client comes in and said "Right. So I have no idea how you think you are moving to Florida when I'm obviously kidnapping you and keeping you in my guest room!" which only made me laugh. I thought saying goodbye to my friends was going to be hard, but saying goodbye to my clients is going to be heartbreaking. I have loved watching their babies grow and come into the world, to hear about them placing in their latest race, being the recipient of their stories from around the world and those amazing moments when they just say thank you. I am invested in my clients for the people they are. And they are invested in me for the care that I bring to them. 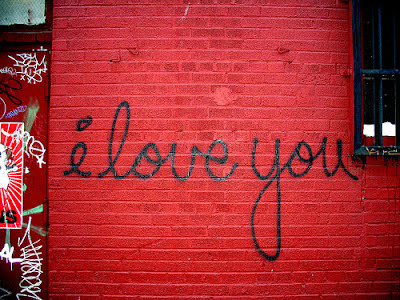 To me, that is not about liking - that is love. 3. I have a specialty. I ran into one of my mentors on the street last week. He practically tackled me with a bear hug and congratulated us on our bravery with such a big move! We got to chatting about the clients I am leaving, and my hope for clients I will meet in Sarasota. He asked me if I had "found my speciality" yet. I thought about my clients. Ages 3 weeks to 92 years old. All the teachers, athletes, moms, dads, lawyers, artists, musicians, moms-to-be, actors, architects, loggers, fireman, trainers, authors, publishers, advertising and marketing specialists, executives, nannies, poets, politicians, massage therapists, accountants, acupuncturists, chefs, students, fashion designers, journalists, marathon runners, filmmakers, yoga teachers, small business owners, dog walkers, non profit champions and so many more. That's when it dawned on me. I have a specialty. I specialize in passionate people. I think that is the most amazing specialty I could have ever asked for, and it found me. I think passionate people suit me quite nicely and have a way of making my life lovely and full! 4. Mending Hands is not all about the money. And never will be. So much so that there have been times that I have sent clients out of my place after a full session with a hug and wave having forgotten to ask for payment. Most of the time one of us remembered (usually before the elevator arrives, but not always). Yet the reactions have been the same "You must really love this when you don't even remember you are doing it to earn a living!". Many massage therapists can report that although you can make a solid living, you don't go into massage to make yourself rich. I limit myself to four clients a day, specifically so no one ever feels like a number or aren't getting the same attention and energy that the first client of the day gets. Limiting clients is a good idea for a massage therapist's care - but not for that profit margin. I never really knew how much I did NOT think about my clients as just additions to my bank account until recently. I announced my relocation and recommended two local private practices. After blogging about my recommendations, I received an angry passive aggressive email from a spa eluding to the fact that they were insulted I didn't just send my clients directly to their company. Do you know what I did? I cried. Here I am making a huge sudden life altering decision, having to tell some amazing clients that I am walking away from our rewarding work and commitment and then I feel like someone is mad at me for not just handing over my "paycheck" to them. Yes, I admit I am an emotional person. No, I didn't cry in front of any clients. But it made me so sad that someone was looking at me leaving as just a whole lot of dollar signs up for the taking and be angry with me for not just handing them over. Most of my clients like the relationship that occurs with a private practice. They like knowing that every cent is going to the livelihood of the person those hard working hands belong to. Even when having to say goodbye to my New York clients, I'm trying to be client centered and suggest like minded therapists who would also value the relationships that can grow. That's not about money. That's about care. 5. Running a business that makes you proud of yourself is priceless. I have learned so much from starting Mending Hands in Brooklyn from scratch. Although in many ways I am starting all over again in Sarasota, I have much more knowledge to take with me. I hope to take some time to blog the details about finding a space, making marketing fit our new neighborhood and the different ways I will try to get my name out there in our new community. One thing I can tell you is this; if you run your business in a way that makes you feel proud of yourself, clients will feel that. They will feel that, they will come back and they will send their friends and loved ones. There are a ton of resources where you can find "how to" tips to be brave and smart and successful as a small business owner. Use these tools! They are extremely helpful! I intend to use them, well…forever. But for me - at least right now, I'm going to hold this thought; when I open Mending Hands in Sarasota, I will think of the things that made me so very proud of Mending Hands in Brooklyn. And when I get that first client I hope that it will be the start of something even more wonderful. It is with a bittersweet heart that I make this announcement. My husband Joe has been scouted to be a professor at the Ringling College of Art and Design in Sarasota, Florida. I am extremely proud of the fact that he has been asked to join this world renowned faculty, yet I am sad to announce that this means I will be moving my private practice to Florida. Each and everyone one of my clients has made Mending Hands in Brooklyn one of the most rewarding and engaging experiences of my life. I have learned so much from each of you. I hope to take what I have learned as a business owner, massage therapist and person with me to our new home. Now, there is still time to see you before I go, so here are some of the details! 1. Starting now, I will not be taking any new clients. I want to make my current clients a priority and hope this makes the time and space to see all of you! 2. I will no longer be offering gift certificates or packages. I also encourage those who have packages or gift certificates (or have purchased as gifts for others) to make sure we find the time to complete those sessions! Finally - I will be rebuilding my mailing list to make sure my newsletter stays relevant. I also want to make sure that none of you feel spammed. If you would like to stay on my mailing list, please just let me know! You are also more than welcome to keep up on my new adventures on the clear beaches of Florida (as well as massage, health and wellness info) by following the Mending Hands blog or on Facebook. As far as where to get your future massages, I would love to recommend my friends and fellow Massage Therapists: Agnes and Megan. If you are ever in Sarasota or have any family or friends in the area, please pass my information along! It has been a beautiful honor to be your massage therapist. I will miss every single one of you. 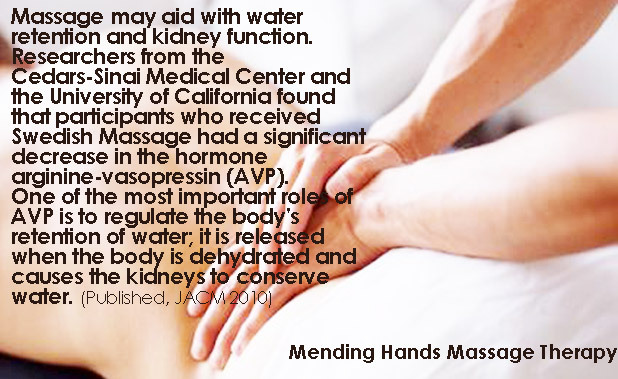 Choose Lavender as your complimentary aromatherapy during your next Mending Hands Massage! Aromatherapy is an effective complement to a massage therapy session. 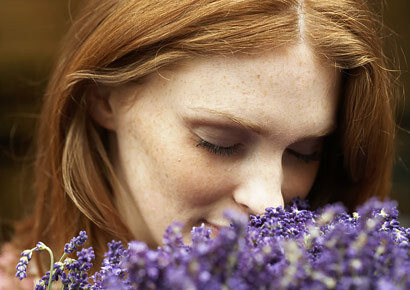 New research indicates lavender aromatherapy provides a significant decrease both stress and pain. Investigators at the Department of Anesthesiology and Pain Medicine, School of Dentistry, Kyungpook National University , Daegu, Korea, set out to measure the effects of lavender aromatherapy on 30 healthy volunteers, according to an abstract published on www.pubmed.gov. The subjects were randomly allocated to two groups: the experimental group received oxygen with a face mask coated with lavender oil for five minutes, and the control group received oxygen through a face mask with no lavender oil for five minutes, the abstract noted. Stress level, and pain intensity of needle insertion before aromatherapy were similar between the two groups; however, the stress values and pain intensity of needle insertion were significantly reduced compared with the control. The research was published in the Journal of Alternative and Complementary Medicine. And yes, I will be sure to GET a massage while I'm taking a break, too! 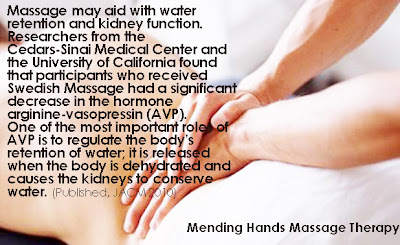 Mending Hands is now offering an extended version of the classic Sinus Massage treatment! Start with a warm relaxing facial steam while your arms and hands are massaged using acupressure points for the Lung and Large Intestine Meridians. These points encourage clearing and cleansing of the body. 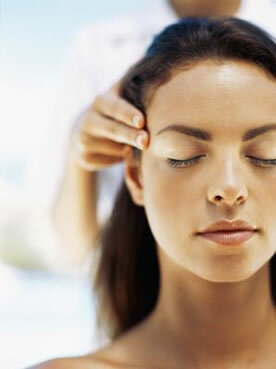 This is followed by a full face and scalp massage to move and shift sinus blockage. This treatment helps with congestion, headaches, tension and respiratory issues. Try this 30 minute holistic treatment from now thru June for just $40! This clearing technique can be booked as a focused session or as an add-on to your full body massage! E-mail melissa@mendinghands.com to book your session soon! As one of the first kinds of healthcare professionals sought for help with musculoskeletal pain, it is no surprise that massage therapists are the preferred choice for helping to relieve neck pain. A skilled massage therapist can offer great relief to those with this prevalent problem; however, the relief may be temporary or can recur. Thus, the suggestions given below are intended to give clients self-reliance tools to prevent the reoccurrence of neck pain - or at least to assist in their pain management efforts at home. 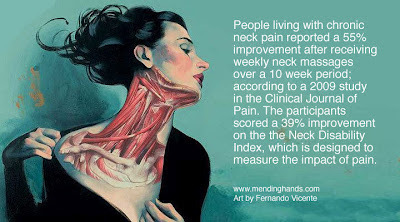 Fortunately, most cases of neck pain are not serious. Ruling out a traumatic incident, a tumor, fracture, pressure on the spinal cord, an infection and a cardiovascular blockage, the most likely culprits of neck pain are strained muscles and osteoarthritis. • Poor sitting alignment while at a desk or computer. • Working with the shoulders forward which causes the head to tilt back. • Sleeping in an awkward position. • Sitting in a car longer than usual. • Looking up repeatedly - for example: painting a ceiling or star gazing. Arthritis or age-related changes can result in bony spurs and narrowed disc space in the cervical vertebrae. Joints with arthritis are more prone to inflammation from repeated movements or sustained positions than healthy joints. Another etiology of cervical pain is emotional stress. 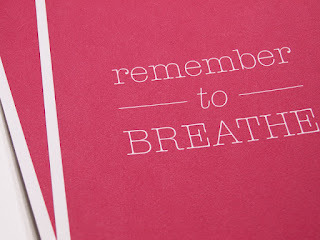 Stress is known to precede apical breathing patterns. 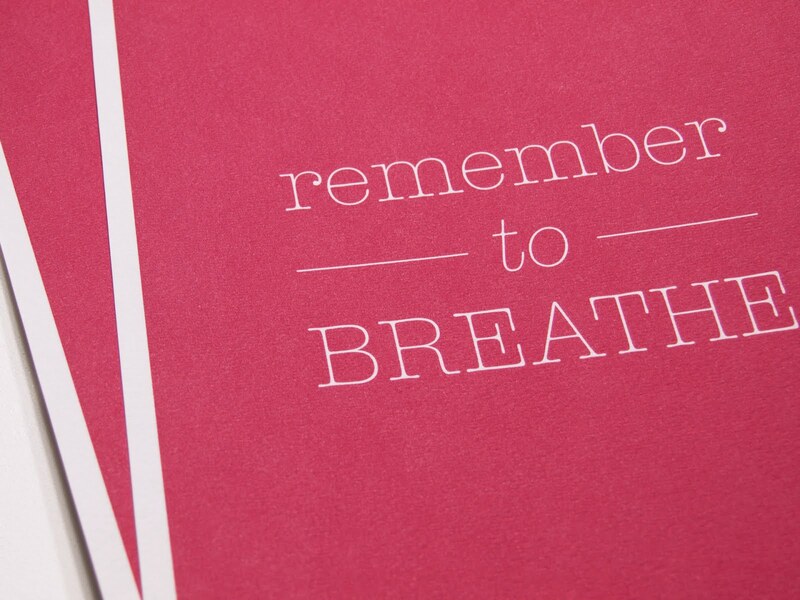 Together, stress and shallow, apical breathing cause neck muscles to tense. If this tension is sustained, a compressive force is exerted on the cervical vertebrae. Waking with a stiff neck or having intensifying neck discomfort can be very painful. 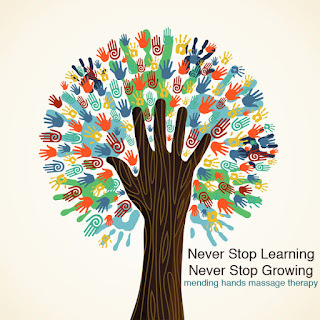 Thankfully, a long list of massage therapy techniques can help release hypertonic neck muscles, activate blood circulation and increase range of motion. However, a healer's intentions go far beyond providing immediate pain relief. Sending clients with neck pain home with a flyer full of suggestions - or at least a verbal recitation of them - can go a long way in helping them deal with this nuisance or even prevent it from happening again. 1. 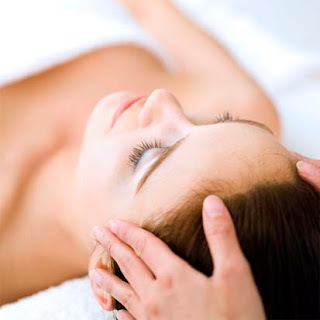 Stress Relief - While stress will aggravate neck pain, relaxation can ease it. Suggestions for accomplishing this feat include deep abdominal breathing, meditation, visualization and other relaxation techniques. 2. Frequent Breaks - Even though sustained positions foster muscle tightness, this practice is deeply ingrained in our culture. 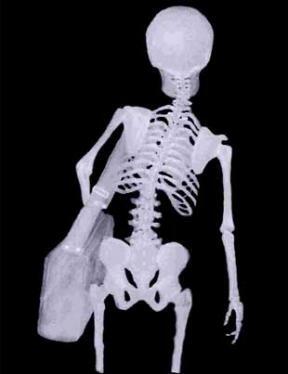 If driving long distances or working long hours in one position, make sure to take frequent breaks. Breaks are best used to stretch, breathe deeply, take a sip of water and return to proper posture. 3. Exercises and Stretches - While some must be prescribed by a physical therapist, a massage therapist can suggest exercises and stretches for the neck as long as they don't cause pain. Exercises and stretches help reduce pain by restoring muscle function, optimizing posture to prevent overload of muscle and increasing the strength and endurance of the neck muscles. These can include shoulder blade rolls/squeezes/shrugs, cervical extension/flexion, rotation, stretching the front wall chest muscles, strengthening the shoulder muscles and isometric exercises. 4. Hot and Cold Therapy - Most practitioners suggest alternating heat and cold to help a stiff, painful neck. Reduce inflammation by applying a cold pack for up to 20 minutes several times a day. Alternate this approach with heat, either a warm shower or a hot pack, for up to 20 minutes. Heat can help relax sore muscles, but it can aggravate inflammation if the area is red, warm and swollen. 5. Evaluate Ergonomics - Adjusting home or workplace conditions to relieve unnecessary neck stress can go a long way in preventing cervical discomfort. This includes proper positioning of a desk, chair, computer and phone so the screen is at eye level, knees are slightly lower than hips, arms rest comfortably on armrests and the neck is in a relaxed neutral position while on the phone. 6. Sleep Deliberately - Since a lot of neck pain can arise from poor positioning during sleep, deliberately planning a sleep position can prevent a painful neck. Avoid sleeping on the stomach and use a pillow that supports the natural curve of the neck. Back sleepers are advised to use a rounded pillow (neck roll) under the curve of the neck, with a flatter pillow cushioning the head. Side sleepers should keep their spine straight by using a pillow that is higher under the neck than the head. The goal is to prevent overnight neck flexion. 7. Sock and Tennis Balls - A simple homemade device can be used for self-administered cervical acupressure. Put two tennis balls in a sock and tie off the sock so the balls are stationary. Place the tennis balls under the occiput so they are pressing on the hollows under the skull on either side of the spine (Gallbladder 20) for about 10 minutes. Lying on this device can help relax taut, posterior neck muscles. With today's fast-paced society, stress and muscle tension are significant sources of neck pain. In fact, a person who has suffered from neck pain in the past is four times more likely to end up with a recurrence of this problem. Although, if armed with these seven strategies, massage therapists can empower their clients to overcome neck pain - and prevent its return. Relieve TMJ Pain with Massage! The jaw or temporomandibular joint (TMJ) is a major target for an array of joint disorders. Disorders of the jaw are typically referred to by the same name, TMJ. The temporomandibular joint connects the mandible to the skull's temporal bone and contributes to the acts of biting, chewing, swallowing, speaking and making facial expressions. The National Institutes of Health (NIH) states over 10 million people in the United States suffer from TMJ problems. 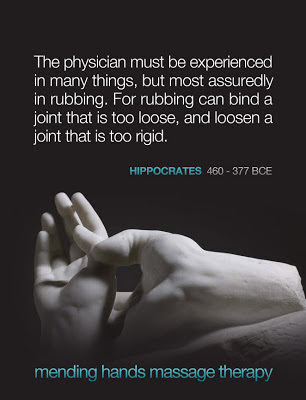 · A bite that feels uncomfortable or "off"
Physicians have long known that paraffin therapy is a veritable way to speed healing and soothe muscle and joint pain. Starting with a hand massage using super rich shea butter, your hands will then be immersed in a bath of warm lavender infused paraffin wax, then wrapped and tucked into warm mittens while you receive a soothing back massage. When the paraffin wax is peeled away your hands will be soft and supple. Your session continues with a full body massage of your choice! Swedish, Deep Tissue, Shiatsu or a focus session to target your aches and pains in more detail. Optionally, you can enjoy this healing treatment for the lower back, shoulders or neck. Don't Call It Pampering: Massage Wants to Be Medicine. 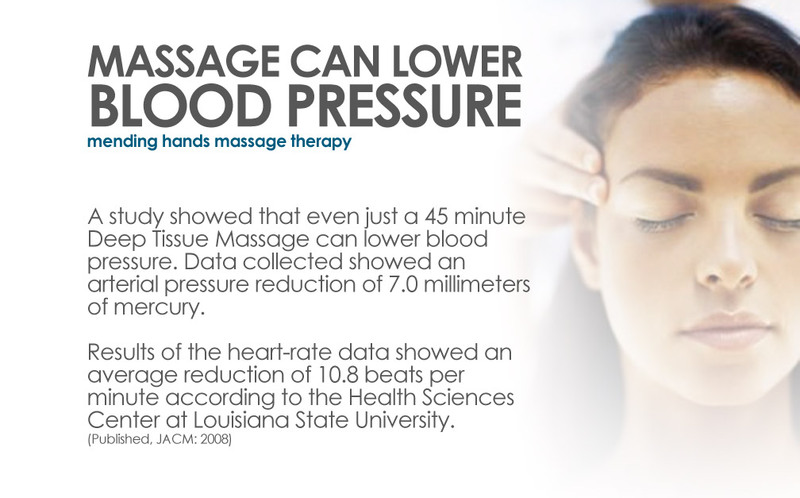 There's been a surge of scientific interest in massage. The National Center for Complementary and Alternative Medicine, part of the National Institutes of Health, is currently spending $2.7 million on massage research, up from $1.5 million in 2002. The Massage Therapy Foundation, a nonprofit organization that funds massage research, held its first scientific conference in 2005. The third conference will be in Boston next year. “Carpal tunnel syndrome symptoms are lessened following massage therapy” was conducted by staff at the Touch Research Institutes at the University of Miami School of Medicine in Miami, Florida. As some of you know, my husband planned a super surprise engagement, wedding & honeymoon for us last year. For our one year anniversary we have planned a series of celebrations! 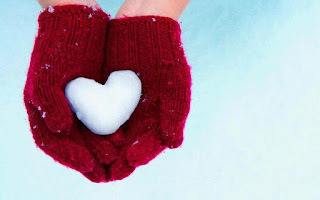 Mending Hands will be closed from 2/18 - 3/1 to spend time with friends & family who have traveled from near & far! E-mail melissa@mendinghands.com to secure your session after this break or to purchase a gift certificate for any events you & your loved ones might be celebrating! 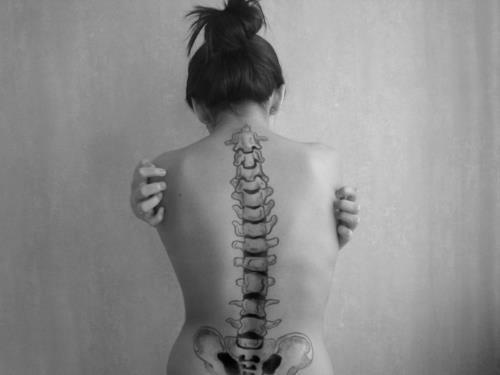 Did You Know: The spine contains over 120 individual muscles, 220 specialized ligaments & over 100 joints! And that's JUST in your back! This information and photo was posting on our Anatomy In Motion Facebook Page. Check it out for loads of really interesting posts and photos of all things Anatomy! Massage therapy and other techniques used by massage therapists— aromatherapy and acupressure among them—have all been indicated by research to relieve depression in clients. 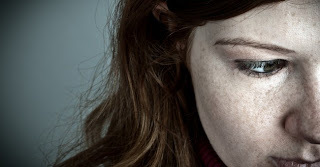 A new report shows depression is a global problem, affecting 121 million people worldwide. Depression can affect a person's ability to work and form relationships, and can simply destroy one's quality of life. Depression leads to 850,000 suicides each year. Researchers from 20 health centers around the world compiled depression data based on detailed interviews with more than 89,000 people. • Fifteen percent of the population from high-income countries were likely to get depression over their lifetime with 5.5 percent having had depression in the last year. • Eleven percent of people in low- and middle-income countries were likely to get depression over their lifetime. • Major depressive episodes were elevated in high-income countries (28 percent compared to 20 percent) and were especially high (over 30 percent) in the U.S., India, France and the Netherlands. • The country with the lowest incidence of major depressive episodes was China, at 12 percent. This is the first study that used a standardized method to compare depression and major depressive episodes across countries and cultures. "We have shown that depression is a significant public-health concern across all regions of the world and is strongly linked to social conditions," said researcher Evelyn Bromet from State University of New York at Stony Brook. "Understanding the patterns and causes of depression can help global initiatives in reducing the impact of depression on individual lives and in reducing the burden to society." Massage. So much better than a boring box of chocolate. E-mail melissa@mendinghands.com to take advantage of this deal! Health Benefits of Grapefruit Essential Oil can be attributed to its properties like diuretic, disinfectant, stimulant, anti depressant, anti septic, aperitif, lymphatic and tonic.Grapefruit, also called Shaddock, is a Citrus fruit, whose scientific name is Citrus Paradisi. It is also known by two other scientific names, Citrus Racemosa and Citrus Maxima. The later, is because of its big size. Like all other citrus fruits, its Essential Oil is present in its peel and extracted by compression. Many of its medicinal properties match those of the essential oils of other citrus fruits. 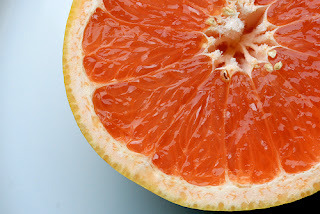 The Grapefruit Essential Oil is composed of Limonene, Alpha Pinene, Sabinene, Myrcene, Geraniol, Linalool, Citronellal, Decyl Acetate, Neryl Acetate and Terpinenol, out of which the top two constituents are Limonene and Myrcene. A grapefruit tastes great and great are the medicinal properties of its essential oil. Let us now see what big benefits the essential oil of this big boy has in store for us. Snow is coming down here in NYC (Finally! Haven't had good snow since that crazy nor'easter during Halloween! ) so I thought, why not have a snow sale? Come enjoy the table warmer, hot towels and the warm relaxation that is unique to massage! Today and tomorrow ONLY - Get $10 off any gift e-certificate for a massage or holistic facial Get a jump on your valentines gifts, buy one for yourself to get a discounted session or use this deal to try out the special Head Massage, Foot Massage or Sinus Relief add ons! Or get your dull winter worn skin back to a glow with a Dry Brush Massage! 3. What service or dollar amount would you like the GC to cover? 4. Is there a special message you would like me to add? 5. What e-mail address should I send the GC to? 6. Let me know what form of payment to expect so I can reply with the correct information. For this special Snow Sale I will only be accepting payment through paypal (AND I'll waive the standard $3 charge for fees, making an actual savings of $13!) or personal check. Offer valid on 1/21/12 & 1/22/12 only. E-certificate delivery only. Cannot be combined with any other discounts or freebies.